First we come to the Default plot setting for new drawings. You can set the default output device from the drop down list of available devices. This really only effects drawing that have not been opened or saved in 2000 format and beyond. This dialog will find any PCS files or setups found on your search path or default system printers. You could set the next radio button to allow AutoCAD to use the last successful plot setting override what is in the file. 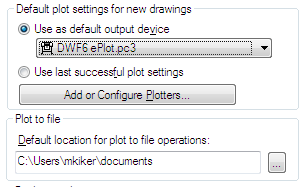 The Add or Configure Plotters button takes you to the new plotter setup process. Lastly – the Plot to file location can be set. Make sure you know where these files are being created. You could change this to the Desktop. I would avoid a network location.